The Rapidograph Humidified Revolving Selector prevents ink from drying in pen points. 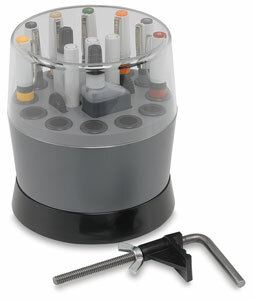 Each set includes 3 pen holders, a bottle of ink, a bottle of pen cleaner, a board clamp, nib keys and a cap for each point. Set Of 7 Points — Sizes 000, 00, 0, 1, 2, 3, and 4. ® Koh-I-Noor is a registered trademark.® Rapidograph is a registered trademark. If you've ever worked in pen and ink before, you know how important it is to have a high quality pen. The Koh-I-Noor Rapidograph technical pen is a legendary art tool that produces consistent lines for fine illustrations and drawing. The Rotring Rapidograph pen is also a quality and versatile technical pen with a disposable ink cartridge.